The RDL RCX-5C Controller is a single space, 19-inch rackmounted unit that is designed to route and control audio for up to five separate zones. The RCX-5C is the centralized controller in the RCX room combining system and is a straightforward means of routing audio in commercial office spaces, retail stores, restaurants, bars, medical offices, etc. 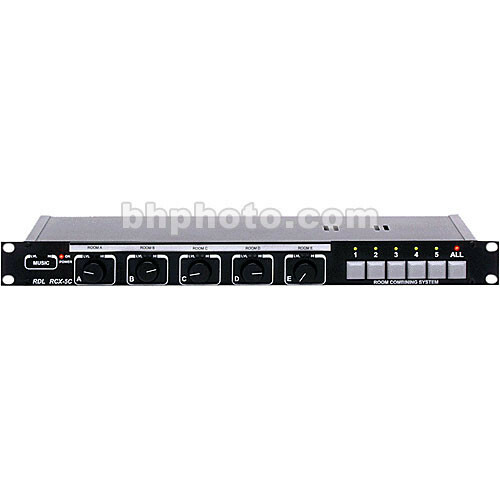 The front panel features five push-button switches for routing line and microphone audio to and from combined or separate rooms. Five level controls are provided for adjusting audio level in individual rooms. The rear panel features terminal-post input and output connections for line audio, dynamic and condenser microphones. Five level controls are provided for adjusting audio level in individual rooms. The front panel features five push-button switches for routing line and microphone audio to and from combined, or separate rooms. The rear panel features terminal-post input and output connections for line audio, dynamic and condenser microphones. Box Dimensions (LxWxH) 19.9 x 8.3 x 2.1"